Exquisite and luxurious, radiant and lavish. Stylish glamorous bathroom combines various trends adopting classic, palace-like, but also modern interior style looks. When planning a glamour style bathroom arrangement, you should remember to follow some fundamental principles and skillfully combine all the elements in such a way that its bold, original, and exceptional nature is preserved. Romantic glamour style bathroom is a combination of rich ornamentation and an ascetic form. This arrangement was made with the use of tiles from Ceramika Paradyż’s Secret/ Edeno collection. When deciding to arrange the bathroom in a glamour style, it is worth considering to furnish it with original furniture characteristic for this kind of interiors. Louis XIV style cupboards and cabinets work very well here. Modern style furniture will also be very appropriate. It is important, however, for them to have original, unusual finishing. Cupboards with countertops or front panels made of mirror will be a good solution here. Glamour style loves glow and splendor, which is why lighting that will accentuate the radiance of tile or furniture front panel surfaces plays such an important role. Crystal chandelier or an elegant lamp will add to the bathroom’s luxurious atmosphere. When selecting the lighting for the bathroom, objects made of high quality materials, such as metal, crystal, glass, satin, or velvet are worth considering. In a modern version of a glamour style bathroom, a classic free-standing bathtub on little legs can be successfully replaced by an oval-shaped tub with shiny mosaic finishing or a free-standing tub with simple, subtle, designer form. Ceramic mosaic is a perfect tiling material for oval-shaped surfaces, such as bathtubs where it would be impossible to lay classic tiles. Central spot of a bathroom should be obviously occupied by a mirror. It would be best if it were in a retro style, in an eye-catching silver, golden, or simply black frame. The retro style mirror isn’t, of course, the only right choice – something modern would also be great. 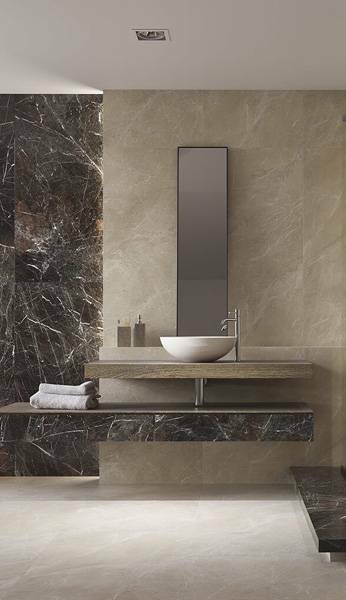 No matter the selected version, one thing is certain – the mirror has to attract attention! Decorative wall and floor tiles are a perfect complement for the glamour style bathroom interior. They should have a clear, decorative design or en elegant print (best in silver or gold). 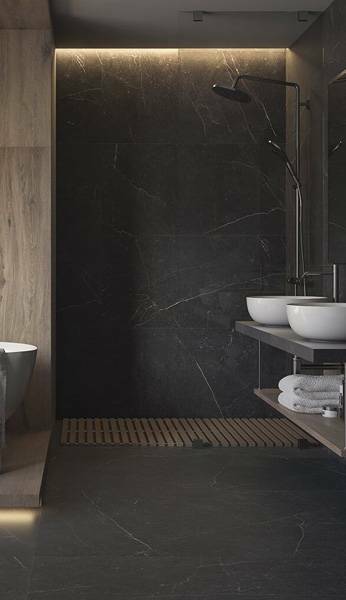 Bathroom tiles are not, however, everything and it would be good to take into account some additional decorative elements to adorn the walls. Elegant glass mosaic or decorative trims with crystals will additionally bring out the original elegant character of a glamour style bathroom. Distinctive decorative design of the wall tiles is an ideal choice for a glamour style bathroom. Ceramika Paradyż’s Bellicita wall tiles collection. Elegant glass mosaic will perfectly accentuate the glamour style of a bathroom. Shiny surface naturally complements the atmosphere of such arrangements. Decorative trim with crystals will give the bathroom even more radiance. Glamour style bathroom is dominated by expressive vivid colors. Those most often used are gold, silver, black, maroon, or intense pink and purple. Glamour style is also characterized by the use of surprising contrasting combinations. It is not difficult, however, to fall into exaggeration and once there, the line between elegance and kitsch becomes very thin. It is enough though to follow some basic advice or employ the help of a designer to achieve the exquisite glamour effect in our bathroom. Glamour style bathroom in red. Free-standing bathtub and crystal chandelier perfectly accentuate the elegant style of the room. Glamour style in a modern version. Shiny decorative wall tiles are a perfect background for sophisticated additional elements that cannot be lacking from any bathroom. Select original furniture, with unusual decorative finishing and shiny front panels. Go with spectacular lighting (crystal chandelier, for example, will be a great choice). Bathtub should match the luxurious style of the interior (if you have such possibility, go with a free-standing tub with an elegant subtle shape). Select a decorative mirror (best option would be one framed in gold or silver). Arrange your bathroom using shiny tiles (those with a decorative design will be a perfect option). Do not exaggerate and select accessories with moderation. 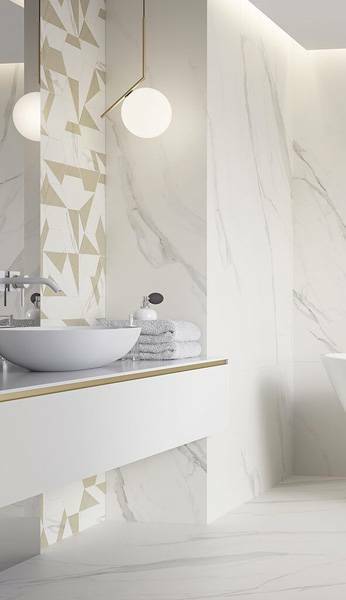 Are you dreaming of a glamour style bathroom? 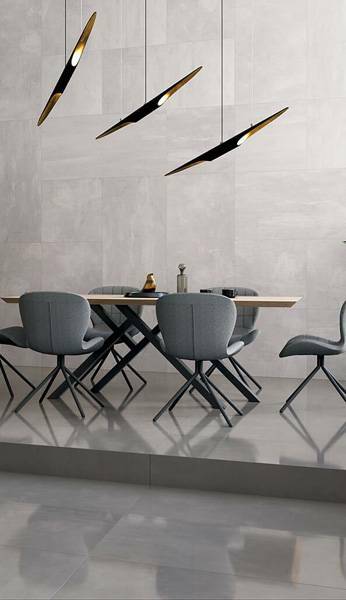 Check out our offer of shiny wall tiles which will perfectly accentuate the luxurious character of an interior. Arrange your glamour style bathroom thanks to the exceptional tiles available in a wide range of colors and designs at Ceramika Paradyż website.